By hungry runner on November 29th, 2011 . Filed under: Holidays, Stationary . Paperless Post is offering a new line of free, informal holiday invitations and cards. 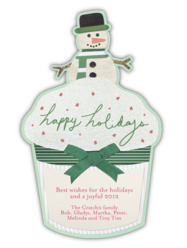 Included in the line is this fun snowman cupcake electronic card, a quick and easy way to wish your friends and family a happy holiday season. Once you sign in to Paperless Post you can customize the text, font style, color, and more!